Grain whisky. An unsung hero in whisky production, it’s usually used in a formula for blends, but increasingly so it’s becoming well-respected in its own right. And that is a very good thing, because done well, they can be a real rival for bourbons and ryes in hitting those sweet notes. I think grain whisky is a great taste bridge between many different types of whiskies – perhaps one of many reasons it’s used a lot in blending. Port Dundas dates to the early 1800s. The site belongs still, I believe, to Diageo, so you can pretty much guess where much of its output ended up – Johnnie Walker, Bells and so on. When it closed in 2010, with the loss of 200 jobs, Diageo moved much of their grain production to Cameron Bridge, meaning Port Dundas became a hallowed lost distillery. And that brings me to the Clan Denny Port Dundas 1992 – 21 Year Old Single Grain, bottled at 55.7%. 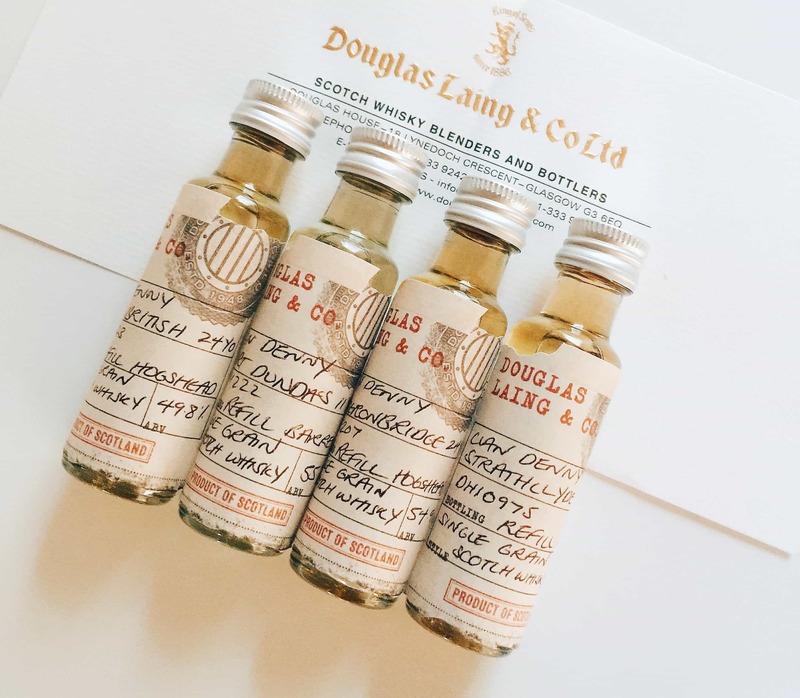 Douglas Laing & Co are doing the world a favour by releasing a lot of single grain whiskies – many of which are pretty old and very affordable. 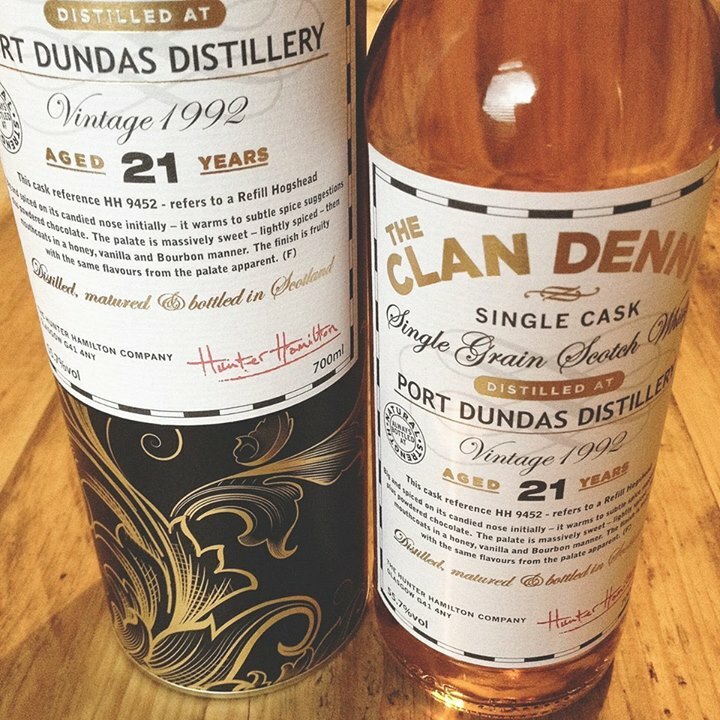 The Clan Denny Port Dundas 1992 is about £70, maybe more in some places. Colour: pure mid-tone amber. It’s weird, it’s like you’d expect your typical blend to be in colour. On the nose: ooh, I love me some grain whisky. Yes, this has some really bold molasses right off the bat. Really rich sultana, raisins. It’s not as over-the-top heady as some grain whiskies (beautiful Nikka single casks, I’m looking at you), but it’s hitting those core notes pretty damn well. In the mouth: this is all over your mouth. Now here’s the thing, it’s not quite as much of a sweet assault as you think it’s going to be. There’s depth here. Yes, there’s plenty of honeyed texture there, but this is delicate stuff. Underneath the intro of dried fruits, there’s maltiness, a touch of citrus. A woodiness that’s very welcome in the mix. Vanilla, menthol – just a slight touch. There’s an almost mouthwash style coolness to this, if you give it a swirl, but that’s not a bad thing in this largely sweet whisky. This is a great little single grain whisky – something special for the end of session whisky, as well as being something to share with friends. In fact, get your friends around and show them something different with this.